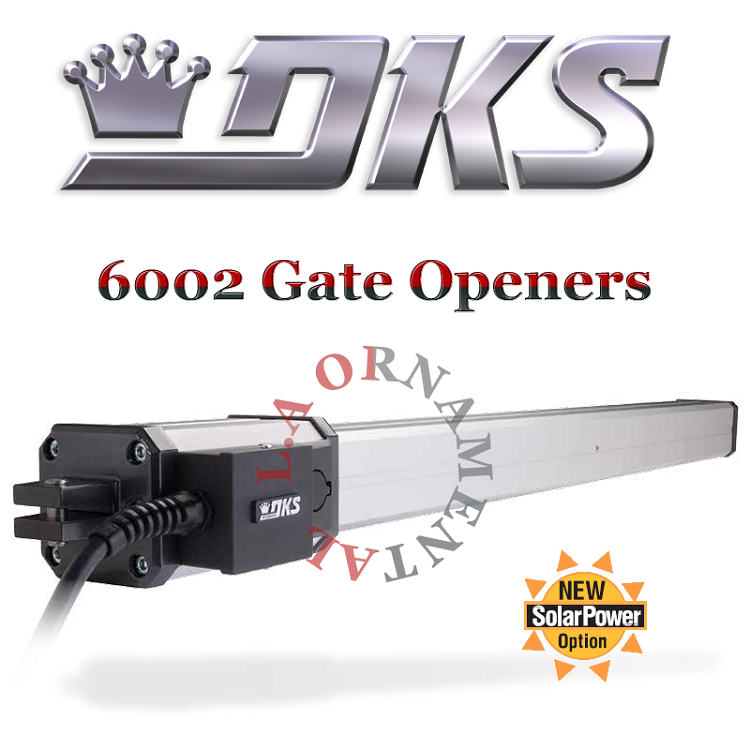 The DKS swing gate actuator offers convenience and reliability in a compact design. The actuator mounts directly on your gate and pilaster, simplifying installation and eliminating the need for concrete pads. The elegant lines obtained by using extruded aluminum material provide a clean profile that will blend in with any gate design. But beauty is not just skin deep with the DKS actuator. The powerful screw driven piston connects directly to the gate eliminating weak mechanical connections and it is fully enclosed to prevent dirt and other airborne corrosives from contaminating the screw threads. And there is no need to worry about hydraulic leaks, check valves or pumps. 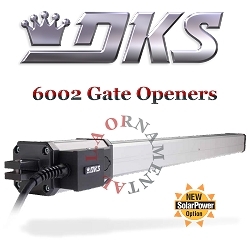 The 6002 actuator operates on 24 Volt DC power and features built in limit switches that precisely control the start / stop speed, and travel of your gate. The microprocessor based electronic control board provides many advanced features typically not found in operators in this class. The control box can be powered by 120 Volt AC, which is then converted to 24 Volt DC to power the actuator and control board. Two 120 Volt control boxes are available to choose from, Deluxe and Standard. The Deluxe control box includes three 120 VAC outlets to power accessory transformers. Both include 3.5 Ah (Amp Hour) batteries for back-up power operation. You can also select our Solar Powered control box, which eliminates the need for high voltage power runs. Overlap feature for dual swing gate operation. Magnetic lock output. Ports for plug-in loop detectors. Keyed release for manual operation. Swings gate 90 degrees in approximately 16-seconds. Actuator operates at 24 Volts DC power.